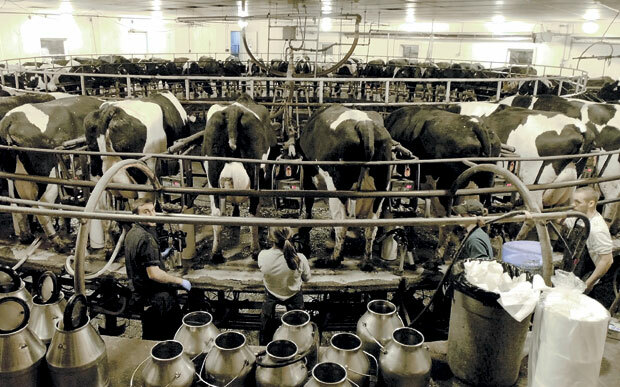 Milkers are busy milking in the rotary parlor at the Flood Brothers Farm in Clinton Thursday night. The parlor rotates on 20,000 gal. of water and holds 50 cows at a time. The farm's 1,450 milk cows produce approximately 15,000 gal. of milk per day. The farm is currently in the process of constructing a similar rotary parlor which will hold 100 cows at a time and will be one of the largest parlors in the country, according to farmer Dana Flood.